So, this is not the first book about a young boy with a dragon pet. I bet you can think of a few yourself. Which begs the question, what makes this book standout from the crowd, what makes it so unique, good and worthy of the book of the week spot? Tomas helps his grandfather with his unwieldy garden, and one day stumbles upon a strange tree growing the most peculiar looking fruit. He takes one of the fruits home, and later that evening is immensely surprised to discover a dragon hatching from it. What follows is the trials and tribulations experienced when hatching your own baby dragon. But for me, Shepherd’s unique selling point is not her plot, although it moves with pace, but her ability to mix humour and fun with an intense pathos and understanding of human emotion. It is Tomas’ interaction with the other human characters that really pulls on the reader’s emotions – although there is plenty of fun to be had with the dragon too. Tomas has a little sister Lolli, who although too young to talk, communicates and spars with Tomas brilliantly in her capacity as co-conspirator in hiding the dragon. Their alliance also demonstrates the uniqueness of sibling relationships – the bond that stretches from affectionate love and sharing of secrets and a helpful camaraderie at one end, to being able to blame the other for something they didn’t do at the other extreme. The sympathetic grandparent relationship within the story also rings true, and draws the most pathos. Tomas loves spending time with his grandfather, but is torn with guilt between how much time he spends with him versus time with his friends, and Tom also shows an acute awareness, in a wondrous childlike fashion, of how delicate the relationship is as his grandfather gets older and more fragile. The feeling of not wanting to disappoint and yet also wanting to live his own best life compete beautifully within the plot structure. This gamut of human emotion also stretches to Tomas’ new pet dragon. Feelings of responsibility compete with curiosity and awe, the knowledge of having something different and special and being the envy of one’s peers, and yet knowing that the dragon is precious and special and not merely for showing off – in fact it’s a live being with feelings of its own. There are some lovely touches here – the timidity of the dragon at first, the portrayal of its physicality as it learns to trust Tomas, and Tomas’ inventive efforts to control the poos and treat his dragon correctly. But none of this overshadows the sheer fun and vivacity of the novel. 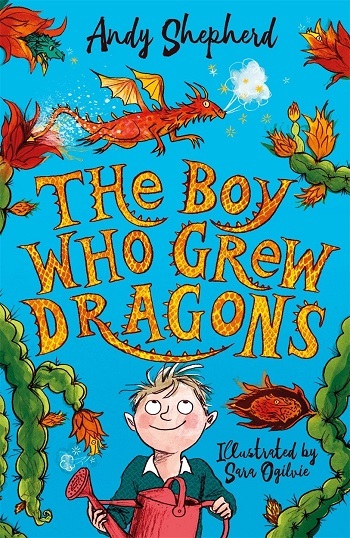 Shepherd brings out every flourish of her imagination in Tomas’s discovery – from the tree itself with glowing fruit, to the different types of dragons, their combustible poos, and how difficult dragons are to capture and hide. Sara Ogilvie’s illustrations here do what they did for the characters in Phil Earle’s Storey Street series, and she brings to life the tree, the dragons and characters with limitless expression. These are warm, animated, engaging illustrations that almost seem to move across the page. This is a sumptuous start to a new series, bursting with energy and humour, yet tinged with the darker side of life too. There’s a grumpy neighbour, aware but preoccupied parents, an eclectic group of friends, a strange gardening guide, nomenclature of dragon pets – so many facets all covered and explored. A perfect example of domesticity interrupted with a touch of magic. Dragon fruit will never look the same again! Happily for 7+ years; you can buy it here.